My writing projects begin when I get infatuated with the subject matter. Several years ago, while preparing a children’s workshop on writing about art, I succumbed to the charms of Rousseau’s “Sleeping Gypsy.” What kind of person, I wondered, would make such a sweet, mysterious painting? At that point all I knew was that Rousseau was a “primitive” known primarily for his jungle scenes. I’m a French major who loves art history. I wanted to know more. In my initial research I learned that Rousseau faced staggering obstacles throughout his career: poverty, lack of training, and most of all, the savage reception from the art establishment. I found it poignant that his jungles were entirely imagined, that he’d never had the chance to travel. Conflict and triumph are important elements of compelling narrative — so I sensed good story potential. My hunt continued. Rousseau did not write an autobiography, so I had to get the sense of his life and times by reading what his friends and acquaintances said about him. Piecing together accounts by the poet Andre Salmon, the novelist Roch Grey, art dealer Wilhelm Uhde and others, I learned about bohemian Paris, Rousseau’s behavior and demeanor as he painted, what his little studio looked like, his daily outings, a description of the parties he threw when he had a little extra money — and also the one Picasso threw for him. Letters written by Rousseau to Apollinaire (one asking for a loan of 20 or 30 francs to pay for clothing and a pair of shoes) gave me an idea of how poor he truly was. I also read excerpts from the scathing reviews. 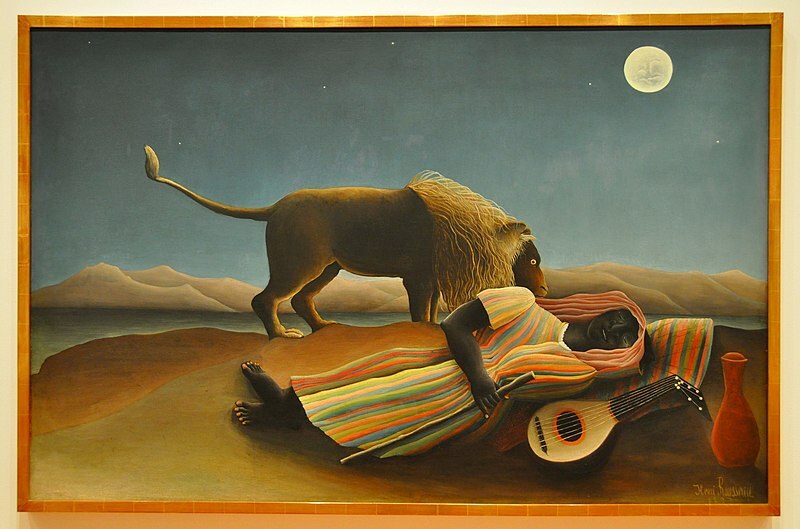 Critics said Rousseau had the easy glory of being ridiculous, and that Sleeping Gypsy was screamingly funny. They said things like, “I prefer to devote my attention to painters who have talent,” “Rousseau had a big success as a laughing stock, and well deserved,” and made other nasty remarks, which I put in the text. I thought it was incredibly moving that the artist could pick up his paintbrush after reading such criticism. His level of commitment seemed heroic. As a writer who has suffered rejection, I deeply related to Rousseau’s situation, and I believed kids would too. Children can be very direct, and mean, in commenting on each others’ artwork, which is so personal, such an extension of one’s self. 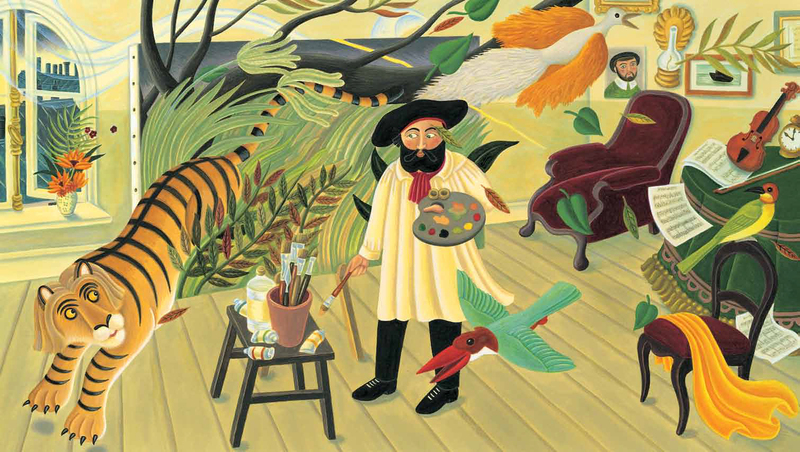 I became convinced that Rousseau’s artistic journey would appeal to kids on several levels. Some modern reviewers have suggested that when he painted, he returned to a more primal state. He went to “where the wild things are,” shall we say. Children appreciate absurdity and dream-states, like the surrealists did. As they’re socialized, they learn that they are supposed to tame their instinctual wildness and let go of their inner fantasy worlds. Yet here is Rousseau, an adult who celebrates those things! And who forges on and prevails, despite humiliating rejection. Out of my research a classic folk tale took shape — with an endearing hero and a series of trials. It pulled at my collar and said, You’re the one! Write me! Then there was no turning back. I was completely swept away. I’d take walks in the evening and start seeing the trees and plants and leaves as Rousseau might. After the manuscript was acquired by Eerdmans, and I saw what a remarkable job the art director had done with Amanda Hall’s gorgeous, sophisticated illustrations, I suspected the book would appeal to adults as well as children. It was a thrill to see the wonderful post about it on Brain Pickings, a website that appeals to many types of creatives. I hope that The Fantastic Jungles of Henri Rousseau will offer encouragement to anyone who struggles to pursue their most glorious dreams, no matter what age they are. Michelle Markel is the author of many children’s books, is a founding member of The Children’s Authors Network, and teaches writing classes for young people as part of the UCLA Extension’s Writer’s Program. 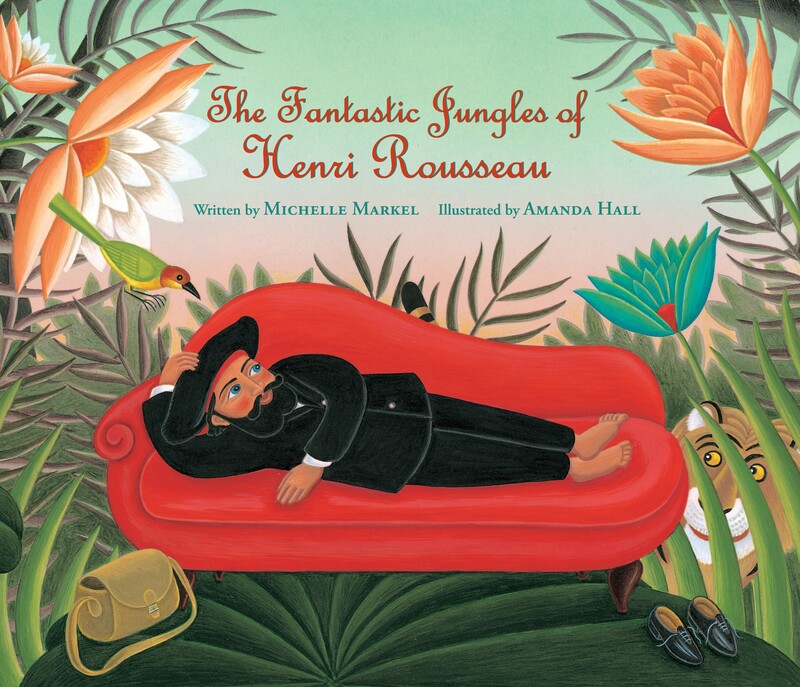 Learn more on her website, michellemarkel.com, and click to order The Fantastic Jungles of Henri Rousseau.